A lot has happened at Sunnyside since you read the last Communique. Starting with last Sabbath, it was such a full and blessed day. From Communion to the Strawberry Vespers, to the Strawberry feed, to the concert with the Heritage Singers. It is safe to say that we had at least 750 people here for the Heritage concert and that includes a very good attendance for everything else. Thanks again to the Wescotts for leading out in this. Sunday was prep day for VBS that started Monday evening. Attendance has been over a hundred each night and every adult who comes and watches comments that this is one of the best ever VBS’s for excellent content and organization. We have had a large number of community people attend. A big thanks is due to all of the volunteers who have put in so much time into this program; some have been here even after a full days work. And speaking of VBS volunteers, there will be an appreciation lunch provided for you right after church in the fellowship room. Just bring yourself; the food is taken care of. Are you available on Sunday morning and in need of a good workout and wishing to do a good deed in the same effort? The Landscape Committee would like you to come join them from 9-11 a.m. on Sunday with your favorite hoe, trimmer, rake, wheelbarrow, or what every else you might prefer to assist in a late spring clean-up around the church. Come tomorrow and meet the many attendees from the community as well as to see our own kids and staff as they wrap-up the VBS week with a Sabbath worship service. Oh yes, Happy 100 to Bill Williams—Sunday at 2:00 p.m.
A landscape work bee is happening on Sunday, June 29, 9-11 am. The Landscape Committee is asking you to bring your garden rakes, hoes, shovels, and wheelbarrows. We will be attacking and removing weeds along the Market Street area. Thank you for your help. Bill Williams turned 100 years of age yesterday, June 27. Come and celebrate his birthday with him on Sunday, June 29, 2:00 pm, here in the Fellowship Hall. All are welcome. Our monthly fellowship potluck will be next week. Since it is now summer, we will enjoy picnic foods. The oven will not be available. Please plan your food accordingly and bring enough food for your family as well as extra to serve our guests. This is a great time to visit with friends and make new acquaintances. Oregon Camp Meeting is almost here! The Primary division still needs helpers to assist the children with crafts. Teenagers over 14 are welcome to volunteer. Please contact Pastor Shirley if you are available, 503-539-3106. On July 2, 7:30 pm, Travis Hatton will be conducting a concert at the First Baptist Church, downtown Portland, featuring Haydn’s C Major Cello Concertowith Efe Baltacigil, the Principal Cellist of the Seattle Symphony Orchestra. All are welcome. Happy 4th of July! Sunnyside Adventist Church and Portland Fire and Rescue are asking that you help make this time of year one of the safest. 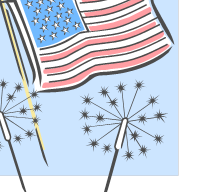 Portland Fire and Rescue has made it easy to determine which fireworks are safe and legal, and has provided a list of approved fireworks displays in the area. Go to http://goo.gl/xgD90Z or click on the QR code.